We’ve just received word that Albert’s bail hearing will proceed on Monday, March 2nd at 9:30am in Courtroom 6 of the US Middle District Court in Baton Rouge (777 Florida St.). Albert will be present; and though we know it is short notice, local supporters are urged to attend if at all possible. 48 hours ago the State submitted a written request for Federal District Court Judge James A. Brady to cancel Albert’s Monday, March 2nd bail hearing on the grounds that his reindictment moves the question of release from federal to state jurisdiction. Though Albert has retained his right to petition for bail in the state system if needed, Albert’s legal team maintains that jurisdiction over custody and release properly remains with the federal courts until the habeas appeal process is complete, regardless of whether he has been reindicted or not. 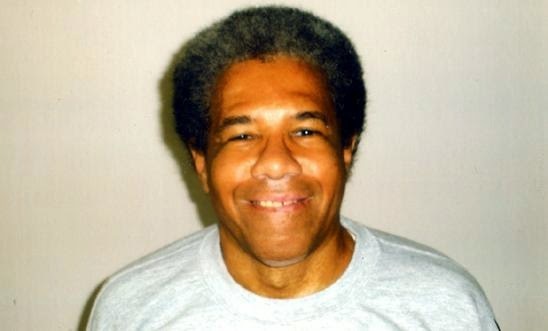 Amnesty International has just released a new video entitled “Free Albert Woodfox: 43 Years of Injustice,” (on You Tube and Facebook) featuring an interview with Juan Mendez, the UN Special Rapporteur on Torture and Other Cruel, Inhuman and Degrading Treatment or Punishment. The video was made in support of Amnesty’s new petition campaign focusing on Albert’s pending application for release on bail. On Feb. 23, the KPFA radio show Africa Today, focused on Albert Woodfox’s case, featuring interviews with Robert King and Amnesty USA’s Jasmine Heiss, shown to the right at an earlier event (listen here). Robert King concluded the show by reminding us to stay focused on the task at hand. “There is nothing else to do but to continue to fight… Herman was released. Albert will be out pretty soon but the struggle continues,” said King, who then emphasized that the fight for Albert’s release is part of a larger struggle against mass incarceration and human rights violations throughout the US prison system.